Did you know that around 110,000 home burglaries could be prevented every year with regular garage door maintenance? Your garage is one of the main entrance points to your home, but is usually not included in a standard home alarm security system. When the door is faulty, doesn’t close properly or doesn’t lock properly, it’s practically an invitation for burglars! 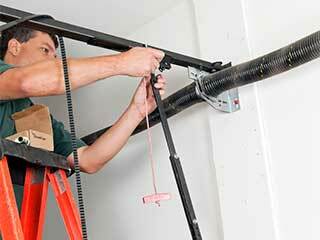 Ensure your home and family are safe with our professional maintenance services. Why You Need Maintenance Checks – Safety! Behind the clean façade of your garage door lies an intricate system of working parts. From the weighted door springs to the transmitter, every part needs to be in top working condition to prevent malfunctions that could require more costly repairs and could also be extremely dangerous. The Reverse Safety Mechanism, for example, is designed to prevent the door from closing on a person or object stuck underneath. If it’s malfunctioning, it means that your door will not detect if something, or someone, is stuck underneath while it’s closing. If your door is not closing or opening properly, it will likely leave your home open to burglars. Most people’s alarm systems don’t include their garage and, oddly enough, they don’t even lock the door between their garage and their home. Even people who do lock the door from the garage to their home may not consider how many valuables are stored in their garage! From bicycles to cars and old computers to sports equipment, garages can be a gold mine for burglars! When you call our highly skilled technicians in for a maintenance check, we will make sure every part of your garage mechanism is in top working condition. If a part needs replacing, we can do it safely, on the spot and at minimal cost to you. Your garage door is a weighted and finely tuned mechanism. If you wait until it breaks down before you call in our specialists, more often than not when one part breaks, it can cause the weight to be unbalanced and break more parts. A little prevention will save you time and money. Call our reliable technicians today for fast, affordable and professional maintenance services.